Saint-Germain is a destination for visitors from all around the world who come to shop and (most importantly) to eat. For this tour, we’ll be exploring some of the tiniest and most special food shops in this gastronomically-gifted neighborhood. This upscale neighborhood boasts the most impressive concentration of chocolate and pastry shops in Paris, and perhaps the world. 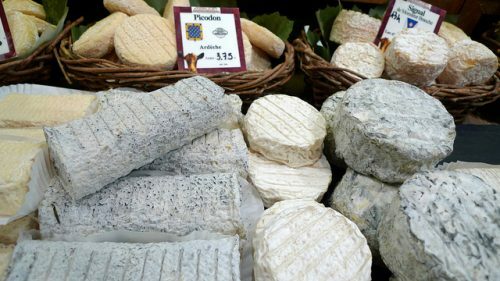 But don’t worry, we’ll also be sharing an impressive array of savory delights, from iconic breads to carefully aged cheeses to artisanal charcuterie. We’ll be tasting a bit along the way and finishing at a table where pair our “picnic” finds with different estate bottled wines. Price for a small group tour: 110€ per person, including all tastings. Our tours are all conducted in English and last approximately three hours. All tours finish with a seated tasting that includes wine, but we’ll be on our feet and moving for at least two hours throughout the tour. We’ll send you the exact meeting point upon booking, but you can plan to finish near the Saint-Germain-des-Prés métro stop. We maintain very small group sizes and are unable to add guests to tours that don’t have enough available tickets. Send us an email if your desired dates are sold out or if you have any other questions. We hope to meet you soon! A refund of 75% is available for those who cancel with at least 48 hours advance notice. No refunds will be given for clients who cancel with less than 48 hours notice, or arrive more than 20 minutes late without calling, or don’t show up at all (no-shows). Our tours run rain or shine. The Louvre? Sure. The Eiffel Tower? Yeah, you and 10,000 of your closest friends. Food tour of the gastronomic capital of the world? Insanely great. Maximum of 7 people. Three food shops, 1 food market and 1 wine shop. A taste at each of the 3 food shops, and an indoor picnic of food market items in the back room of the wine shop. Each purveyor was world class in their respective speciality. Seriously world class. Our guide Patrick is the most convivial and charming Irishman you’re likely to meet. Incredible command of the history and product of each shop as well as deep background of each speciality: bakery goods, chocolate, macarons, cheese, charcuterie and wine. The curveball? I am wheelchair bound and the “walking” tour was easy to roll with only 1 narrow doorway. The best experience of our Paris stay. Thanks Patrick.